Question: US representatives have said more than once that Russia is hindering the adoption of sanctions against North Korea. US President Donald Trump said this week that Russia is not helping the US at all with North Korea. The Russian Foreign Ministry has announced today that Russia has always been committed to its international obligations. What would you tell the US President? Sergey Lavrov: Not to trust [allegations]. Our American colleagues say that we are not cooperative, and we say that we are and ask them to provide facts of our alleged failure to implement UN Security Council decisions. Regrettably, not a single fact has been provided in many other situations when we were accused of sins such as interference in the internal affairs of all countries without exception. They say that they do have information but it is confidential. We all remember our favourite actor, Arnold Schwarzenegger, saying “Trust me” without providing a single fact. Shall we apply this principle as well? I don’t think we will achieve much if we follow such rules. No concrete or specific talks can be held without facts, which is also true about your question on North Korea and UNSC sanctions. A special committee has been established at the UN Security Council to deal with problems and complaints. When no specific complaints are submitted to this committee, this means that there are no specific complaints. This is all I can say on this matter. Question: The Pentagon has published the new National Defence Strategy today, where the focus is shifted from terrorism to inter-state competition. The key US priority is confrontation with Russia and China. In other words, Russia has been officially declared an adversary. What would you say on this? Sergey Lavrov: I believe that China is named as the most aggressive economic power in that document. It next mentions Russia as a country that allegedly violates some rules of the game. According to the new US defence strategy, China and Russia are undermining the international order from within the system. The military in any country seek to justify the need for additional allocations. We should take this factor into account. In principle, we regret that the United States, instead of conducting a normal dialogue and act on the basis of international law, is trying to affirm its leadership through confrontation-based concepts and strategies. The new US defence strategy says that after WWII the United States and its allies created a new world order, which Russia and China are undermining from within. I believe they could have pointed out, just out of courtesy, that the UN, which represents the new world order, was created with direct contribution from the Soviet Union, that is, our country. But anyway, we are ready for dialogue. We are also ready to discuss military doctrines, as in the past when our militaries were working to build up confidence. I am sure that there are many reasonable people in the United States who understand that strategic stability must be maintained, that any risks to strategic stability must be dealt with, and that this cannot be done without Russian-US cooperation. Question: The United States is no longer treated as an acceptable intermediary in the Middle East. Can Russia take the vacated place? Maybe Russia and China could become the new intermediaries between Israel and Palestine? Sergey Lavrov: Russia has never shirked its responsibilities regarding mediation between Israel and Palestine both as a member of the international quartet of intermediaries and at the bilateral level. Some two years ago we sensed the interest of Israelis and Palestinians and invited Israeli Prime Minister Benjamin Netanyahu and Palestinian President Mahmoud Abbas to meet in Russia without any preconditions. This proposal is still on the table. As far as I know, Mr Abbas is ready for this meeting. Our immediate plans include contacts with the leaders of Palestine and Israel. We want to get first-hand information about possible solutions to this serious and very unpleasant situation. Question: You know about the attempt to undermine the activity of UNRWA. You know that the US has decided to put a freeze on its donation to the agency’s fund. UNRWA supports 5 million Palestinian refugees. What suggestions do you have? Can Russia substitute the lost donation? Sergey Lavrov: Russia is one of the donors for UNRWA. Of course, we cannot compare our modest donation to the American one. The decision to initially stop donating, and then to pay half of the previously agreed sum, of course, seriously undermines the relief efforts for the Palestinian refugees in the region. We will consult with all interested parties and will see what can be done here. Question: What do you think about United Nations Envoy to Syria Staffan de Mistura’s call to hold talks on the Syrian constitution in Vienna on January 25? Russia planned to discuss this matter in Sochi on January 29. Will Russia pursue this, or will you be forced to postpone the meeting until February, especially given the boycott by the majority of opposition groups, including the Moscow and Cairo platforms? Sergey Lavrov: I see these events as mutually supportive. The efforts that we began taking a year ago together with Iran and Turkey resulted in what is now known as the Astana process. These efforts prompted the UN to resume active work. Before the Astana meeting was announced in December 2016, the UN had not done anything for over 10 months and repeatedly postponed the planned negotiation rounds. The Astana meeting boosted the Geneva process. Last year, the UN again took a reserved position and waited for our Saudi colleagues to unite the Riyadh, Moscow and Cairo groups, which was done eventually with our support. We welcome this. But again, the new round of negotiations was announced only after we declared the initiative to hold the Syrian National Dialogue Congress in Sochi. Opposition members from the three above-mentioned groups will gather in Vienna. They were successfully united by our Saudi colleagues, but not all of the delegates abandoned the initial conditions. I hope it will not happen again that the delegation leaders demand regime change before they join the negotiating table. I hope this will not happen again. In any case, both in Geneva and Vienna the opposition is represented by three groups comprising people who do not live in Syria. If we are serious about this, then most likely we need to involve all strata of Syrian society in the development of the constitution: all religious and ethnic groups, women, civil society, etc. This is what the initiative of the Sochi Congress is aimed at. We invited over 1,500 Syrian people, including sheikhs, tribal leaders and civil society representatives who will live in the country that they have never left. Naturally, they are interested in their voices being heard alongside those of the emigres during the development of a new constitution. This is the goal of our congress. Following the congress, we want to provide Staffan de Mistura with recommendations on who can also join the constitutional commission. The decision will be taken by the UN, in accordance with Security Council Resolution 2254. Question: Can the Sochi meeting be held without the participation of the High Negotiations Committee? Sergey Lavrov: They have been invited. Let’s first wait for the results, and then talk about it. Question: President of Kazakhstan Nursultan Nazarbayev has recently visited the United States. Russia-US relations were one of the issues discussed by President Nazarbayev and US President Donald Trump. Do you think Kazakhstan will be able to act as a mediator in improving the contacts between the two countries? Sergei Lavrov: Frankly speaking, Moscow and Washington maintain direct contacts at the level of presidents and foreign ministers. Rex Tillerson and I have met eight times during his time in office, and spoke over the phone also about eight times. So we maintain direct contacts. Of course, we appreciate the desire of President of Kazakhstan Nursultan Nazarbayev, as well as the leaders or many other countries, to see an improvement in Russian-US relations. But it probably does not depend on the number and quality of mediators. It depends, first of all, on the readiness of the US to conduct dialogue based on equality and mutual respect, and on the ability of Donald Trump to counteract blatant domestic political intrigues against himself, in which the anti-Russia card is played again and again. We see that the Russian Federation is blamed for everything and this Russophobic game pursues very nasty goals. But I am sure that the time of those who are engaged in it will come to an end, and the US will realise that it is in its interests to develop cooperation with the Russian Federation, including in the area of international security which we are so concerned about today. Question: The reaction of European capitals to the Verkhovna Rada’s law on Donbass reintegration was quite neutral. Moscow, on the other hand, had a very negative reaction. Why? What, in your opinion, could be the practical consequences of this law? Sergey Lavrov: The reintegration law, if we look at it from a legal point of view, crosses out the Minsk Agreements that were unanimously approved by the UN Security Council in a resolution adopted several days after the meeting of the four Normandy format leaders in Minsk. This is absolutely obvious to us. As for the reaction, I have said it many times that there is no doubt – moreover, we know it for certain – that both Europe and Washington understand perfectly well what kind of game the current Kiev government is playing, and see its efforts to drag out its obligations under the Minsk Agreements. I hope that Berlin, Paris, Washington and the other capitals tell Kiev this in private, behind closed doors. But the West cannot publicly criticise its protégé, a government that is totally unable to agree on anything. This is regrettable. We understand that it is related to one’s own prestige and reputation, which is hard to understand sense but that’s life. Our goal is t make sure that everything stated in the Minsk Agreements is implemented. The attempts to lead these discussions someplace else and the urge to find a new agenda and new methods are unacceptable. We are going to defend, calmly and firmly, the honest package of documents signed by Ukrainian President Petro Poroshenko and the leaders of Donetsk and Lugansk. Question: You said that if the US violates the Joint Comprehensive Plan of Action with Iran, it will have serious consequences for North Korea and for similar international agreements in general. Is there still a chance to rescue this agreement and how can it be done without the participation of the US? Is there any discussion with Europeans on finding a solution or a formula to introduce sanctions so that US President Donald Trump does not scrap the deal? Sergey Lavrov: This agreement cannot be implemented if one of the participants leaves it. It will cease to exist. We proceed from this. I think everybody knows this perfectly well, and first of all our European colleagues, who, as I heard, the US will try to convince to take a position similar to Washington’s. This is a decisive moment. You are right in saying that North Korea is watching the situation. The agreement with Iran was that it stops its military nuclear programme and receives relief from sanctions. The same deal was offered to North Korea. But if the deal with Iran becomes a bargaining chip in some political or geopolitical games, how can we convince North Korea to agree to the same deal if it can be scrapped at any time? Question: US leaders are saying that their forces in Syria are there with the sole aim of fighting ISIS terrorists. However, statements are being made claiming that if they are withdrawn from there it will make the Syrian government stronger. How do you read these mixed signals? Sergey Lavrov: This is not the only issue where we are receiving mixed and contradictory messages. A couple of days ago, Americans announced border security forces were being established in Syria, and today they said they were misunderstood and they weren't establishing any forces. But it is a fact that the United States is seriously engaged in forming alternative bodies of power on a huge part of Syrian territory. This, of course, absolutely violates the obligations they have repeatedly accepted, including in the UNSC, to support Syria's sovereignty and territorial integrity. We are concerned about this. I have repeatedly discussed it with US Secretary of State Rex Tillerson. We maintain stable contacts at the expert and military levels. We raise these questions. But I agree with you that the incoherence and the absence of a principled commitment to the things we agree upon are rather typical of modern US diplomacy, including with respect to the reasons the Americans are staying in Syria and the actions of the coalition they lead. US Secretary of State Rex Tillerson has repeatedly told me their only goal and aim is to defeat ISIS. Now they have plans that are much more far-reaching. We have to factor this in and seek ways forward that will not allow the sovereignty of the Syrian state to be undermined. Question: Today the US Ambassador to Afghanistan refuted the assertion that the United States is aiding ISIS. You are well aware of the situation in Afghanistan. How do you assess this statement? Does the United States support ISIS in Afghanistan? Sergey Lavrov: There are many 'leaks' regarding the military in charge of the US coalition in Syria and working in Iraq to the effect that the United States often turns a blind eye to terrorist groups and allows them to escape. This, in particular, was the case with the battle for Deir ez-Zor, when our military through a communications channel with the US military pointed out that militants were approaching the Iraqi border and requested that they be prevented from escaping. However, the Americans refused to do so, claiming that those militants were not actually terrorists as they were not shooting. This was a rather strange response. As regards Afghanistan, several months ago we made a request of the UNSC and the Americans. Many heads of Afghan provinces have claimed they have repeatedly spotted helicopters without identifying insignia that were flying towards ISIS-controlled territories in Afghanistan. We have sent such a request but never received a response, and this still remains a mystery. Obviously, those helicopters were not the ones in operational service with the Afghan army. And it is the coalition that also has helicopters. We would very much like to know what those helicopters were doing in the ISIS-controlled areas we are talking about. While we are on the subject, I will return to the issue of Syria. Many years ago, back when this conflict broke out, I spoke with then US Secretary of State John Kerry about the numerous examples of the United States leaving Jabhat al-Nusra alone. These problems remain. The Washington-led coalition is not fighting Jabhat al-Nusra, and this is bad as Jabhat al-Nusra, just like ISIS, is on the UNSC's list of terrorist organisations. Question: US President Donald Trump has said that the United States would withdraw from the Iranian nuclear deal unless it is renegotiated. On Monday, you said that there would be no renegotiating. Do you think that the nuclear deal with Iran is dead? Sergey Lavrov: It is not dead yet. As far as I understand, US President Donald Trump has said that he will make a final decision in the next review period, due to conclude two to three months from now. The following options are available: Either they meet him halfway and reformulate the deal somehow, or he will withdraw from it. I believe that we will now try hard to prevent this from happening and to preserve the deal. Understandably, Iran will find this unacceptable. I believe that the Europeans also comprehend this danger. Question: Could you comment on a detention of two Reuters journalists in Myanmar? Sergey Lavrov: To be honest, I have not been following this particular case that you have just mentioned. But I believe that it is necessary to address all issues involving ethnic minorities peacefully and in accordance with the norms of international humanitarian law. Question: Is Russia prepared to cooperate with the United States in the context of Washington’s concern with Iran’s activity in the Middle East? Sergey Lavrov: I think you might have expressed what you mean somewhat incorrectly. We are always prepared to cooperate with the United States, other external players and regional powers in resolving issues of the Middle and Near East. We value our dialogue that continues to develop even in these difficult times. But if I understand you correctly, we cannot claim that all Middle East issues boil down to the fact that Iran is hampering their resolution, because this is not true. Iran is a large power, and it is impossible to demand, if you pardon the coarse expression, that it not “stick its nose” anywhere. You see, any large power, including Iran, Saudi Arabia or even such a small power as Qatar, have their own legitimate and, maybe, not so legitimate interests. We need to deal with this issue. Time does not allow us to make simple decisions. For example, Iran is to blame, let’s contain Iran inside its borders, and the situation will take care of itself. But this is not so. We have been suggesting for a long time that efforts be made to somehow start overcoming the central rift in the region between Saudi Arabia and Iran. We suggest that members of the Cooperation Council for the Arab States of the Gulf launch dialogue with Iran, with the support of Russia, the United States, the European Union, China, the Arab League and the Organisation of Islamic Cooperation. This would resemble the “Helsinki process” that led to the establishment of the OSCE. It would become possible to gradually create an atmosphere, starting with confidence-building and transparency measures,that would be much more favourable for addressing this region’s issues on the basis of a balance of interests, rather than by accusing one actor of being the source of all sins. Question: The United States accuses Russia of many things, and you also say that yourself, including with respect to its role in the Balkans. What role does Russia play in the Balkans, and how important is this region for Russia? Sergey Lavrov: Apart from the Balkans, it appears that they are already accusing us of meddling in Mexico and somewhere else. Balkan countries and nations have been our traditional close friends. We share a common history and struggle, including for the independence of Balkan countries, and Russia has made a very substantial contribution to this struggle. We have common spiritual roots and a common religion. Of course, we would like to maintain our friendship with Balkan countries in the future. I don’t see any other role. Regarding Serbia, I would like to say that there is the Russian-Serbian Humanitarian Centre in Nis where eight Russians and ten Serbs work. They monitor the situation with emergencies. They help in the response to various disasters or industrial accidents; they put out fires and dispatch special planes. The Centre has already assisted many countries, not just Serbia but also Montenegro and further west. The US Ambassador in Belgrade is openly demanding that Serbian leaders must not sign an agreement on the privileges and immunities of this Centre’s employees because this is a spy nest and because they must not cooperate with them. At the same time, no questions are asked about the very same privileges and immunities for the Americans and citizens of other NATO member-countries when they hold exercises in Serbia. Everything has been so infused with ideology! Just like they are blaming Iran for Middle East developments (though we are also being blamed for these developments, just like anywhere else), they are now blaming us for all Balkan developments. By the way, people in Montenegro have already stopped talking about the Russian connection and events that they had worried about so loudly some time ago. I believe that there will be a sobering up. We need to cooperate in the Balkans, just like we cooperated when the Dayton agreements, which still form the foundation of Bosnia and Herzegovina, were being coordinated. There are many other examples when we cooperated with our Western colleagues and other countries, including Turkey, to normalise the situation in certain regions of the Balkan Peninsula. Question: What do you think about Dayton 2 in view of Congressman Mike Turner’s statements? Sergey Lavrov: What do you mean by that? I have not heard about it. If you are asking about replacing or revising the Dayton Accords, we are against this. I think Bosnia will simply not be able to withstand it if we begin to fracture the structure of its state again. Question: During your remarks on Monday you mentioned the destabilising impact of US policy and ultimatums. Does Russia think that the United States is losing its global leadership on key issues? 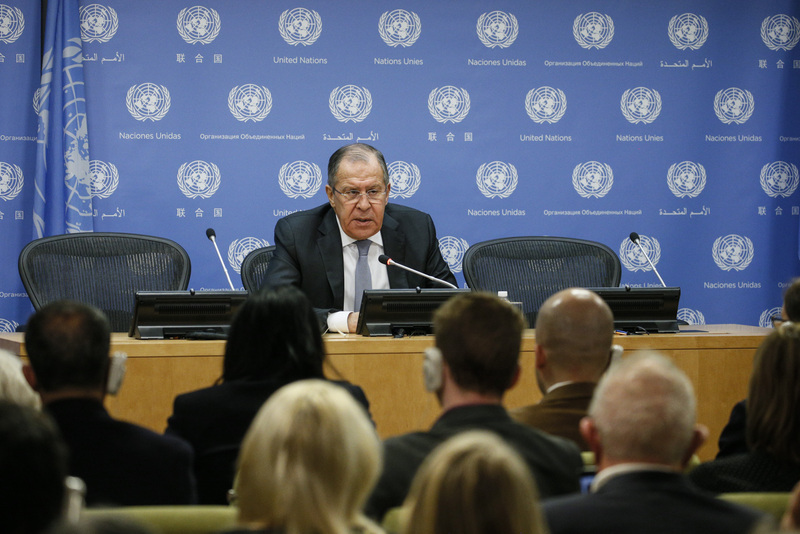 Sergey Lavrov: My view is that in modern world leadership can only be collective. This has already been demonstrated numerous times. The formation of the G20 indicates that it is necessary to develop a joint agenda that involves leading states of all regions in the world. The fight against terrorism also requires joint efforts. The UN is the leader of these anti-terrorist efforts, according to the resolutions we adopt in the UN. It is the Organisation that plays the coordinating role while we all are supposed to help. Of course, a powerful country like the United States can do a great deal to eradicate terrorism. We are interested in coordinating our actions. As you know, I have already mentioned this, we have established communication on Syria between our military forces. To a large extent, this communication prevented ISIS from succeeding as a caliphate and destroyed it although there is still a significant number of terrorists and militants dispersed in the area. The threat remains. We are in favour of addressing all issues together. Speaking of how US actions look on the global stage, you will perhaps draw your own conclusions about how much these actions correspond to the country’s potential and interests rather than the interests of unilateral geopolitical projects. Question: There have been reports from Turkey of Russia withdrawing its observers from Afrin due to the preparations for the Turkish operation. Is it true? What do you think about the Turkish threat? Sergey Lavrov: These reports were later denied. Russia’s main goal in cooperation with Turkey and Iran is to ensure full-fledged functioning of the de-escalation zone in Idlib. Unfortunately, our Turkish partners have not built all the observation posts they were supposed to build under our agreement. There are supposed to be 23 or 24 posts while Turkey has built only a few. We concluded that the lack of fully-functional lookout posts that Turkey was to build has resulted in the militants becoming more active. They even tried to attack the Russian military base in Khmeimim. We spoke to our Turkish counterparts the other day. The contacts between our foreign ministries and the military continue. I think we can tackle these problems and the de-escalation zones will provide stability to this very important region.